A friend of mine asked me to make a special piece for him. 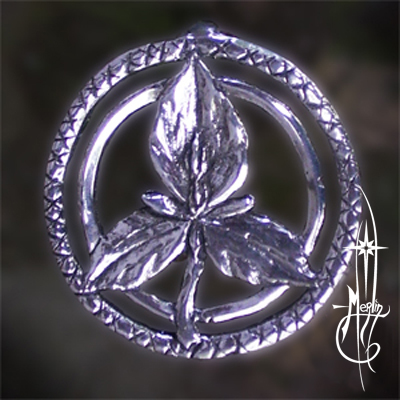 I was able to create the Trillium Amulet. “I am very blessed by the people in my life. Several months ago, I was looking for a way to represent “Home”. I debated lots of different options most of which had “3’s” in them. Then I came across a post I sent to a friend explaining what a trillium flower was. “This particular type of Trillium is native to the Great Smokey Mountains of Tn, Ky, NC, and Ga. I have always had them near me except when I lived in Nevada and West Tennessee. I have never know them in such abundance as where I live now in the house I share with Kaly in the foothills of the Smokey’s. “The name of this species is Trillium Lutem, The Three Fold Flame. I then drew the sketch. Originally it was three circles representing the three worlds of Creation. I removed the center circle which represented Annwn, the Otherworld or the Triple Flame of Creation and replaced it with the Trillium Luteum. hung with a back bail for wearing with a chain or cord. Please visit my how to order Custom Jewelry page.